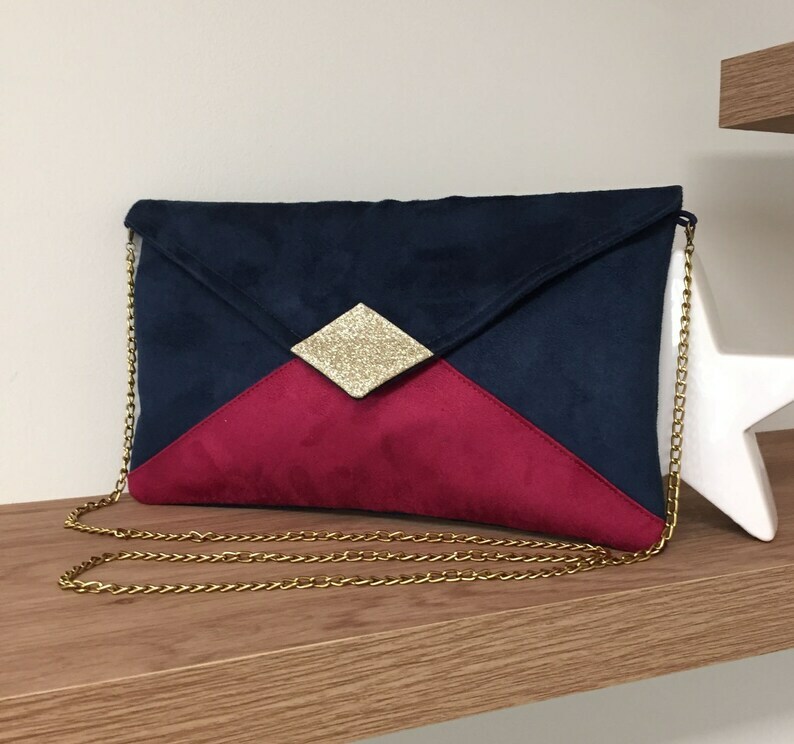 Wedding pouch, evening pouch, navy blue and fushia pink pouch, envelope shape, very trendy for an evening, a wedding, bridesmaids or a ceremony. It is made of navy blue suede with a very velvety feel and a suede effect. The tip of the flap is covered with gold glitter fabric. 2 options are possible: WITH or WITHOUT removable shoulder strap chain, it's up to you! It is lined with perfectly matching printed cotton. The very fine quality of the suede, which is also covered, ensures a very good hold. The flap is closed by a gold magnetic button. It is internally branded "Lesfilsdisa" (permanent glitter flocking). Its dimensions are: 16 cm X 27cm . POSSIBILITY TO PERSONALIZE IT WITH YOUR INITIALS ON REQUEST. The finishes of this bag are very careful, and as a professional, I offer you "the satisfied or refunded guarantee" (see CVG)! You will receive it with a tracking number, nicely packaged and protected, ready to offer! © Pattern design is registered by Lesfilsdisa and protected : any reproduction, in whole or in part, is strictly prohibited. Any fraudster will be sue!